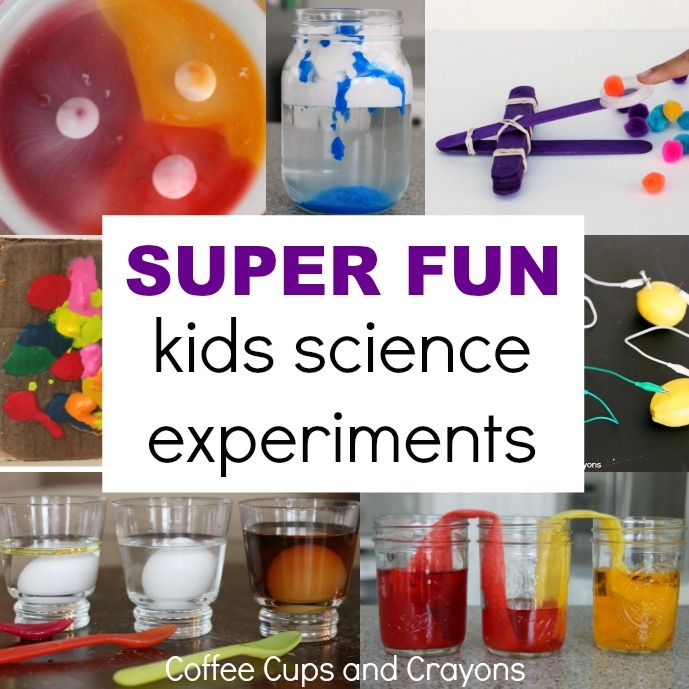 We love to do science experiments at home! It not just lots of fun it also keeps the kids thinking like scientists and developing their problem solving skills. 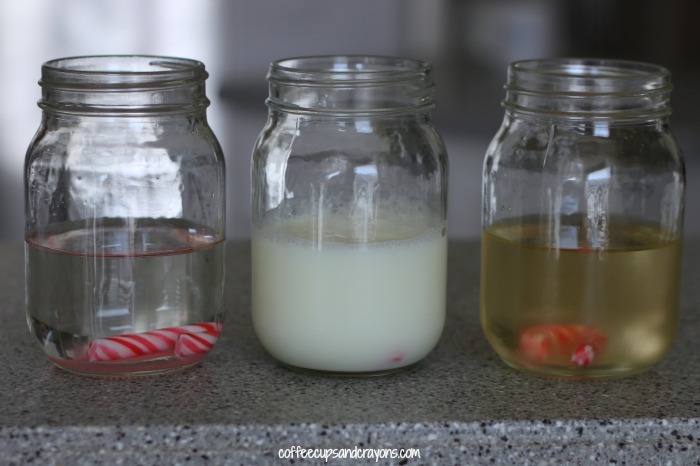 My kids love to experiment with candy and decided to do a candy cane experiment to see which liquid would dissolve them the fastest. And the results were very cool! 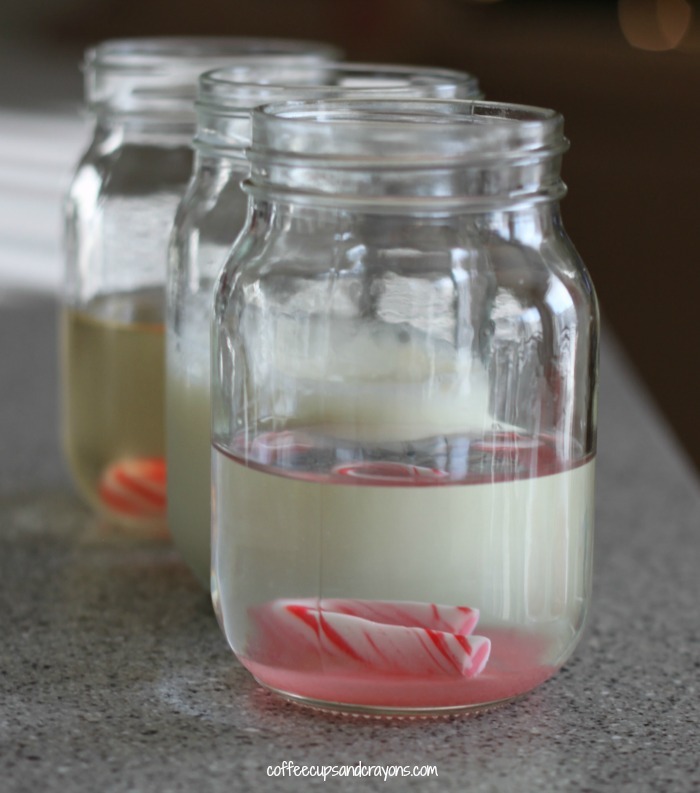 We filled each of our jars with the same amount of water, milk, and juice and unwrapped our candy canes. We’ve done lots of candy experiments so knew the sugary candy canes would dissolve in each of the liquids, but the kids weren’t sure which one would do it first. They each made a prediction and we placed a small candy cane inside each jar to see what would happen! The coolest part about doing sugary candy experiments is how fast you start to see results. 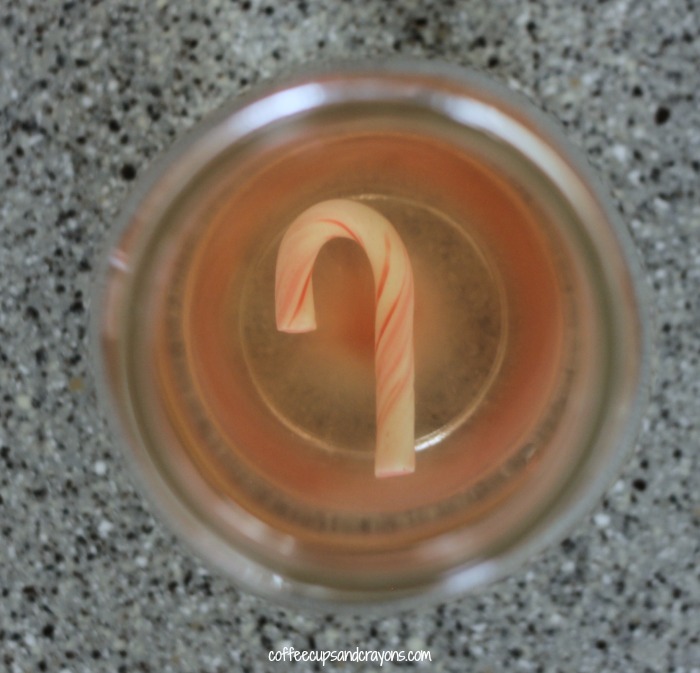 The candy cane in the water started to dissolve right away. 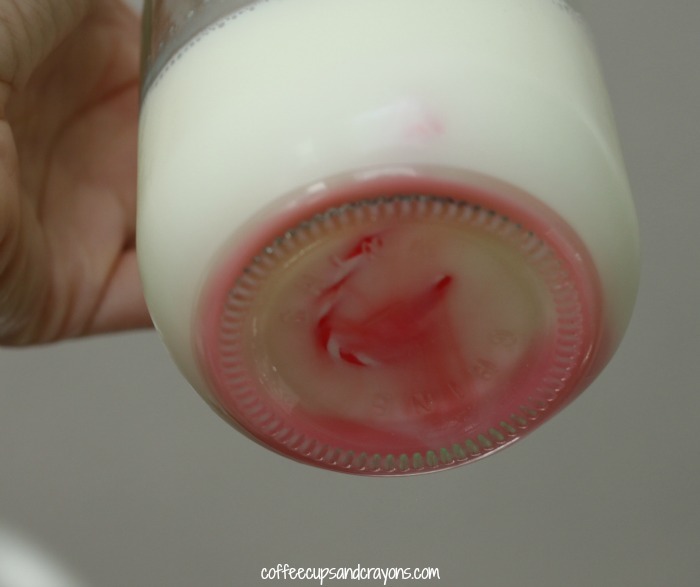 It was hard to see through the milk so we weren’t sure how fast that candy cane was dissolving. Turns out more than we thought! The candy cane in the water was dissolving the quickest, but the one in the milk was the next fastest! 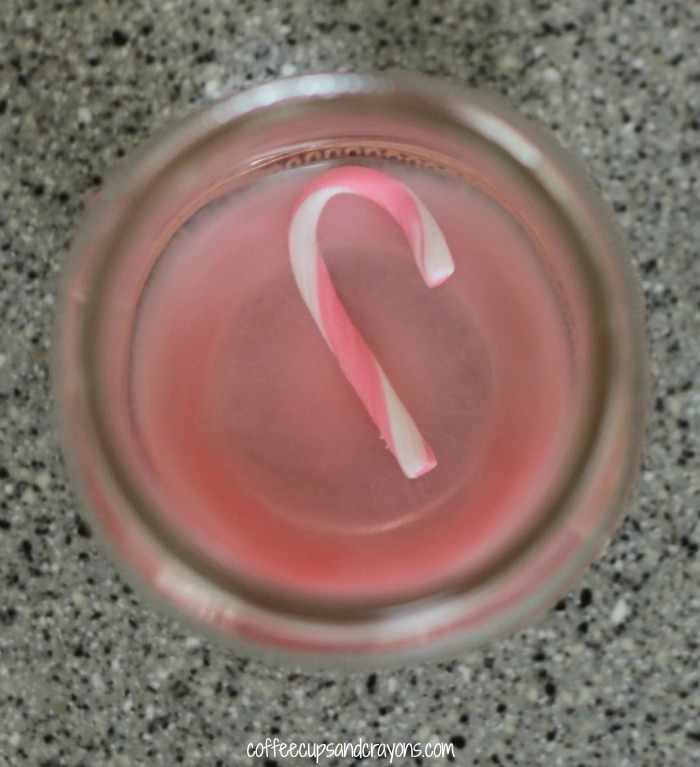 The candy cane in the juice was the slowest to dissolve which made it the easiest to observe. We could see the different layers of the candy cane dissolve off one by one. After the candy canes had completely dissolved they sampled what the liquids then tasted like. 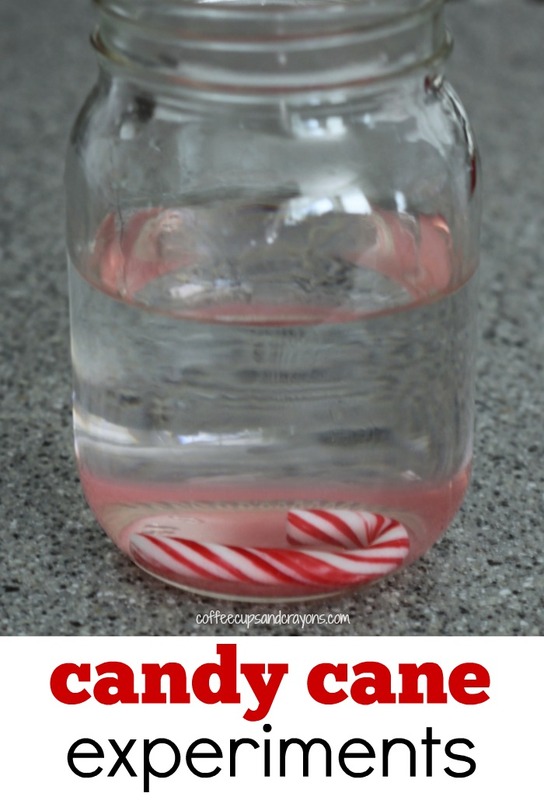 Everyone loved the mint flavored juice–candy cane science experiment success! Love this site of yours! Thanks! Did you keep all 3 in the fridge? You’d have to refrigerate the milk, so to make it even, I assume all were stored in the fridge and then just taken out to check on them. Abbey great question! It dissolved fast enough that we were able to just watch it on the counter. We used the small candy canes you see in the pics so larger ones would take longer and probably need to be refrigerated if you wanted to taste them at the end. Thank you, Megan! I’m using this tomorrow in our kids game room at work with lots of different liquids. I’ll let you know how it goes. I always follow your blog. Love it!